What really needs to be said that has not already been said about this master director behind this film. Fritz Lang is the very definition of master in film making. From masterpieces of the silent film world all the way to the talkies. His extraordinary gift of excellence is something that is mind numbing, every time you watch his films. I grew up obsessed with his mastery. Such classics as 1927’s Metropolis to my personal favorite film, one of my top 20 films, 1931’s M, starring the one and only Peter Lorre. Lang is someone I always obsess about in the film world. I was so happy to learn that Twilight Time choose this beauty, The Big Heat, one of Lang’s greats for their Special Edition 3,000 Unit Blu-ray, Encore Edition. 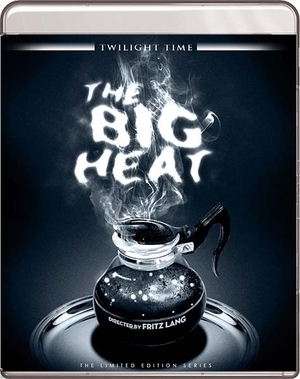 The Big Heat is a fantastic film. A flawless cast. Tight Direction. A classic crime noir thriller that remains perfect today, as it was, when it came out. Twilight Time has done a fantastic job in bringing this classic to a new generation. A wonderful Blu-ray to own. All one has to do is look at the cast. Glenn Ford, Gloria Grahame, Jocelyn Brando, Jeanette Nolan, Lee Marvin, Carolyn Jones and Alexander Scourby who I want to talk about. He plays the perfect villain. He is an actor that shinned in films. He had a voice like no other. A deep voice that stood out and made you notice. He not only was an actor, but he put that amazing voice to work, as a voice actor. He not only stared beside Glenn Ford in The Big Heat, but a year before, he stared alongside him in Affair in Trinidad, and also stared alongside him again in 1956’s Ransom. He also might I add for all you lower budget, Drive-in, B-movie lovers out there, he acted in the one a kind 1985’s The Stuff, which is a cheesy classic. The Stuff was his last feature film. One of his claims to fame and memorable realities is he read the King James version of the Bible, all 84 hours in audio form. Besides James Earl Jones, this version of the bible is one of the best. Both Jones and Scourby give a great reality to book on audio. Also he stared in one of my personal favorite epic films 1956’s Giant. He had such a talent that sadly was never used the way it should have been. He was underrated and majorly underappreciated. I have to mention Jeanette Nolan. She had parts in many memorable films right alongside her husband the one and only John McIntire, both of them often worked together. From parts in 1960’s masterpiece Psycho to the long running TV show Wagon Train. Jeanette Nolan’s part in Alfred Hitchcock’s Psycho is in voice only, she was the one and only voice of Norman’s mama, Norma Bates. Jeanette along with her husband John would do voice talents to some on my favorite Disney animated films. John would do the voice of Rufus in Disney’s Rescuers and Jeanette would do the voice of Muskrat Ellie Mae in Disney’s The Rescuers. John would also do the voice of Badger in Disney’s The Fox and the Hound and his wife Jeanette would do the voice of Widow Tweed. She was a gifted and extraordinary actress that left a shining reality in film and her performance in The Big Heat is no different as all the others who grace this film. The plot is about Detective Sgt. Dave Bannion (Glenn Ford) fighting against the corruption and criminal element in a small town. Dave investigates the death of a fellow officer named Tom Duncan. Basically ruled a suicide. But the woman he is having an affair with believes otherwise. Soon Dave is pressured to close the case. Needless to say like a good crime caper, the mistress is found dead, tortured. Soon Dave finds himself threatened by an unknown person or persons. The main criminal element in the town is the character Mike Lagana (Alexander Scourby) who is a mob boss. Lagana has his control over the city and line the pockets of some of the police. Dave finds that the people are scared and allow the criminal world to run them over, directed by Lagana who control and force others under his will. Soon Dave’s life is turned upside down and the world of justice turns it’s back on him, and so he becomes a man seeking justice and vengeance upon the criminal world. This is a great film. A great experience on this new outlet. A perfect example of how to treat a classic film that stands the test of time, and becomes all the more brilliant as you watch it on this lovely blu-ray by Twilight Time. Another flawless example of audio and video. A great crisp image. A wonderful black and white clarity. The audio is spot on. Most of the time I really find no flaw in these Twilight Time Blu-ray’s. Twilight Time always does an amazing job in expressing cinema. Isolated Score Track. As in most all releases by Twilight Time you get the amazing isolated score track which is a great way to hear the music. Henry Vars who shockingly and sadly was uncredited for this film did the music. He was part of the film business, supplying music from 1930 all the way up to the 70’s. A composer, conductor, musical director, he did it all. He composed for a variety of entertainment. From TV to motion picture. It was really great hearing this isolated score track, another wonderful special feature. Audio Commentary with Film Historians Lem Dobbs, Julie Kirgo, and Nick Redman. Triple dose of perfection. What more could you want than three film historians talking about a film. I absolutely love these commentaries that Twilight Time supplies. Dobbs, Kirgo and Redman are pure perfection in cinema love. They know cinema. They know what film lovers want to hear. Another great listen. Two programs by two of the great directors alive today, Michael Mann on The Big Heat and Martin Scorsese on The Big Heat. Two masters talking about a masterpiece of Crime Noir. Both of these are priceless. A wonderful transfer to Blu-ray. Awesome amazing acting. Mastery in direction. Great special features. The Big Heat is a film that never gets old. It’s a movie I can return to often. Knowing that one of the greatest directors in all of cinema history directed this film, makes me want to return to it over and over again. Twilight Time has done a fantastic job in bringing this out. I highly recommend this special edition blu-ray from Twilight Time. In my viewpoint it’s a must own. Another great job in honoring a film.